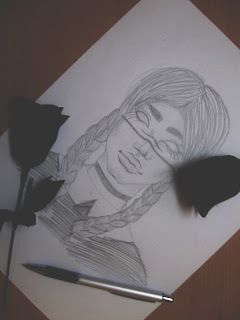 Nevermind, on this blog, as you can see, I'll post drawings, photos, makeup looks, in one word - art. I am not a pro, just a 13 years old girl who loves art SO much, but I hope I will become a pro one day! Currently, I am trying to sold some of my work to buy wacom tablet and Canon EOS 650d. If you wonder, I am shooting with Canon Powershot A580. Yeah, don't judge, I know... xD That's older than the Bible lol.. Here I will post new photos and drawings, but if you want to see my older work, click here. Btw, one of the newest drawing I did.^^ This is just a sketch, but I'll finish it soon in Paint Tool SAI when i buy graphic tablet.